The Christmas Quiz. 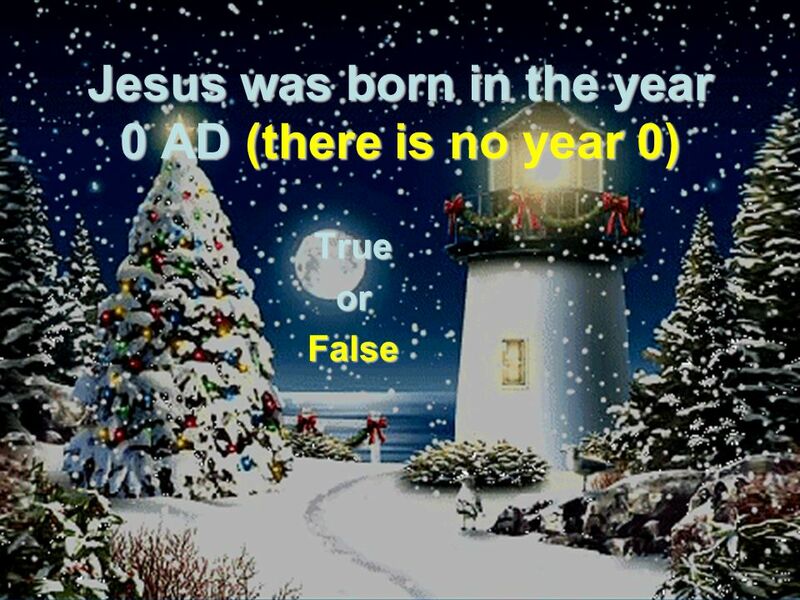 Jesus was born on December 25. TrueorFalse. 4 The weather on the night of Jesus’ birth was… a.Rainy but warm b.Clear and cold c.Snowy d.Who knows? 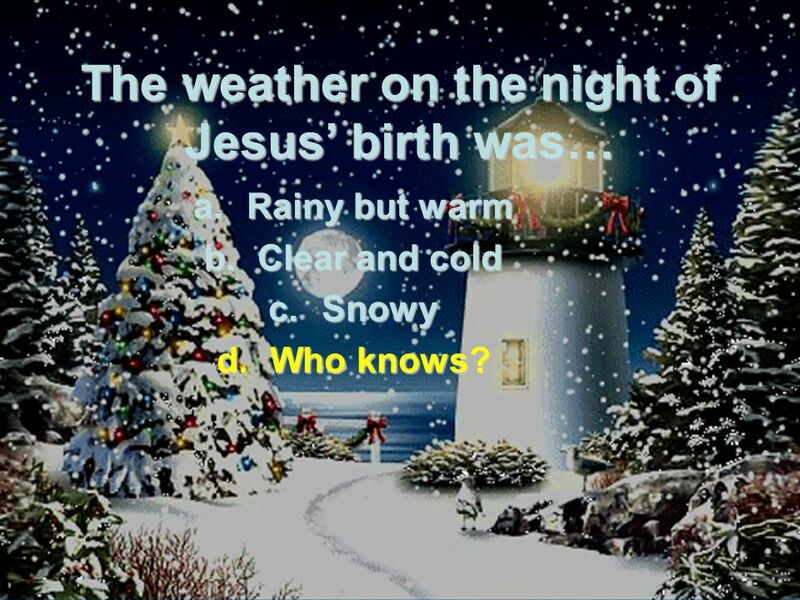 5 The weather on the night of Jesus’ birth was… a.Rainy but warm b.Clear and cold c.Snowy d.Who knows? 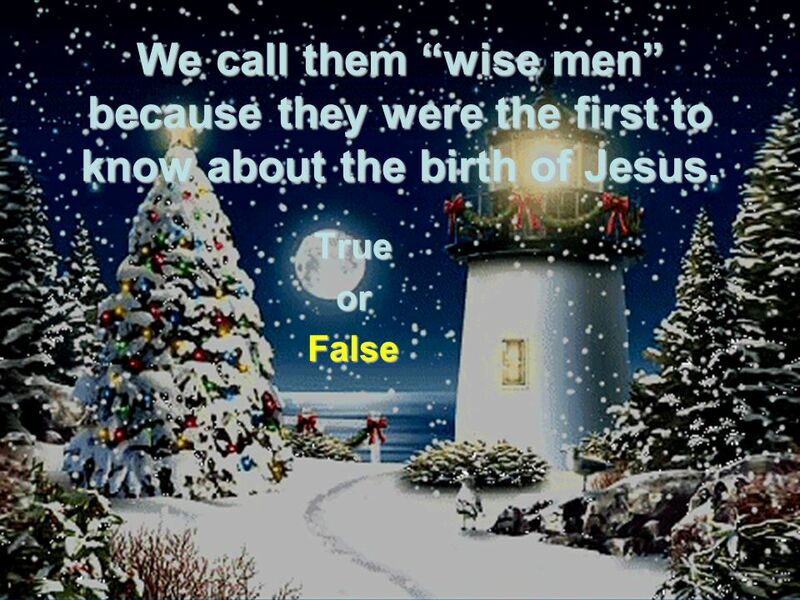 10 How many wise men came to visit Jesus? 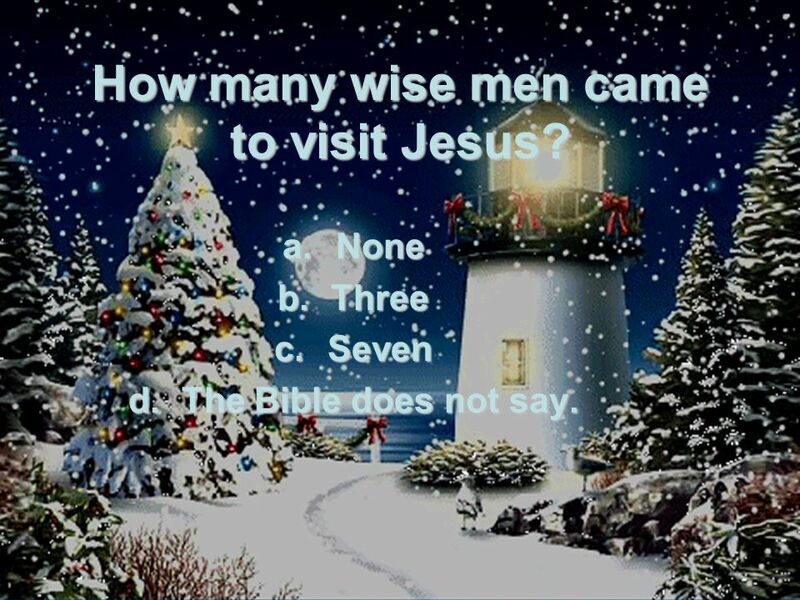 a.None b.Three c.Seven d.The Bible does not say. 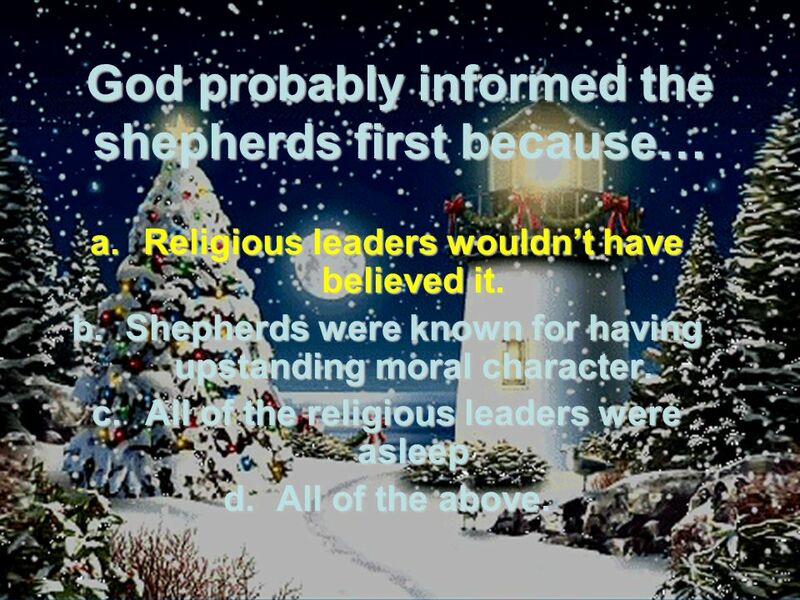 18 God probably informed the shepherds first because… a.Religious leaders wouldn’t have believed it. b.Shepherds were known for having upstanding moral character. c.All of the religious leaders were asleep d.All of the above. 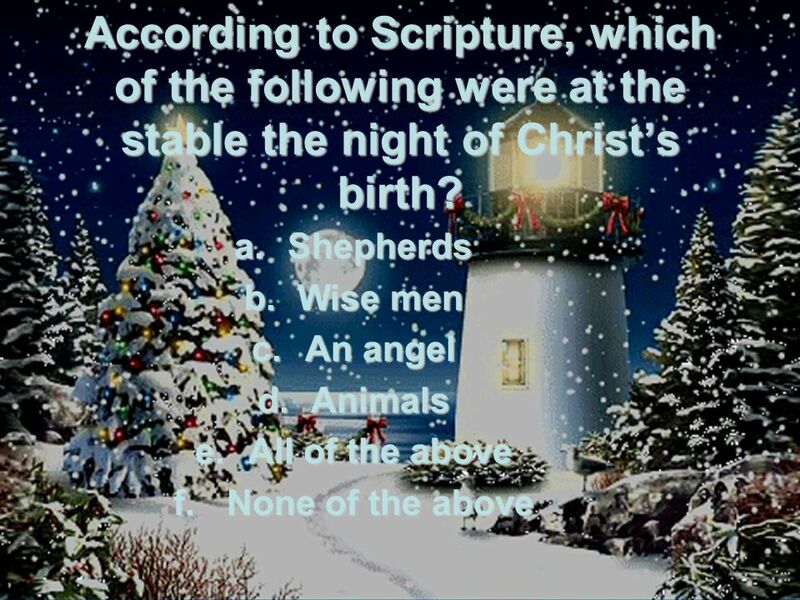 19 God probably informed the shepherds first because… a.Religious leaders wouldn’t have believed it. b.Shepherds were known for having upstanding moral character. c.All of the religious leaders were asleep d.All of the above. 20 Why was he called Jesus of Nazareth if he was born in Bethlehem? 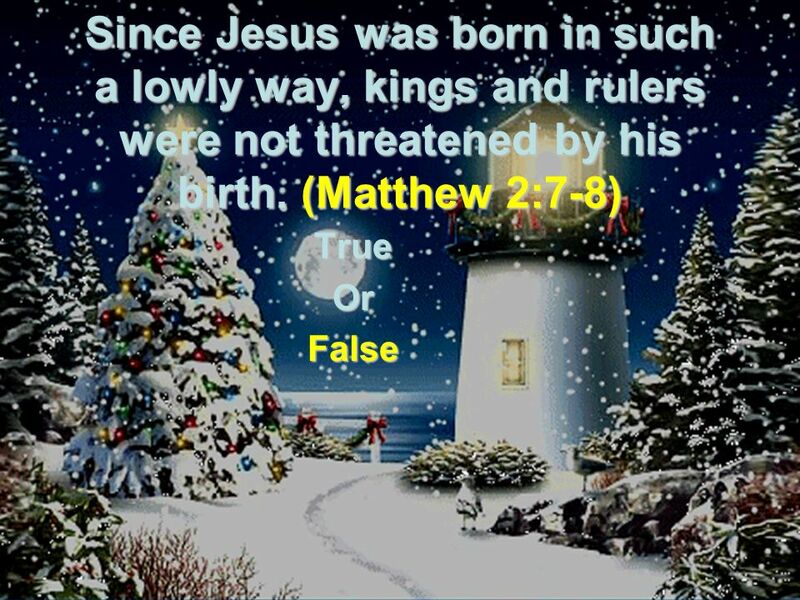 a.“Jesus of Bethlehem” was already taken. 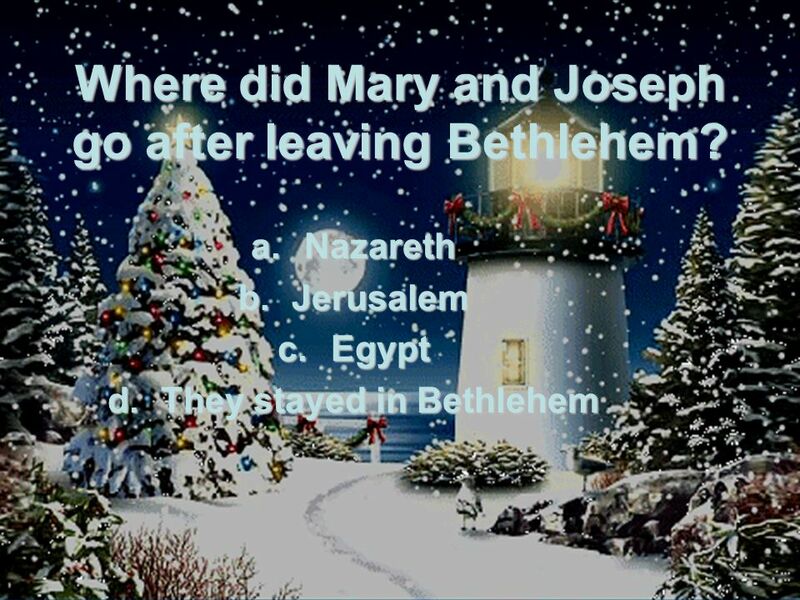 b.Mary and Joseph were from Nazareth but happened to be in Bethlehem at the time of the birth. 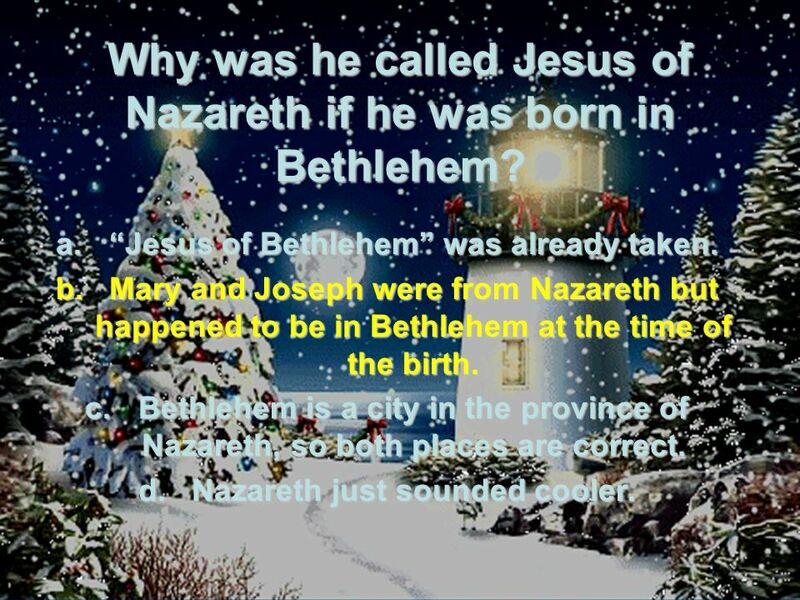 c.Bethlehem is a city in the province of Nazareth, so both places are correct. d.Nazareth just sounded cooler. 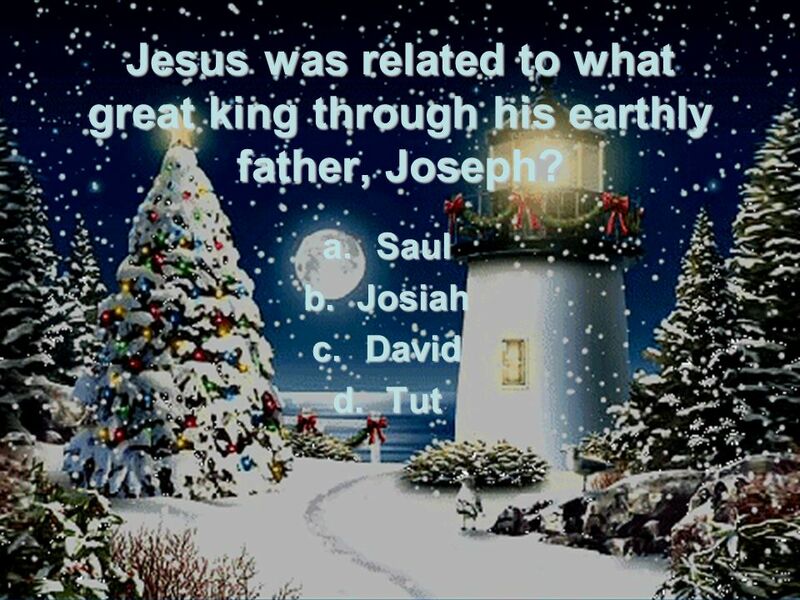 21 Why was he called Jesus of Nazareth if he was born in Bethlehem? a.“Jesus of Bethlehem” was already taken. b.Mary and Joseph were from Nazareth but happened to be in Bethlehem at the time of the birth. c.Bethlehem is a city in the province of Nazareth, so both places are correct. d.Nazareth just sounded cooler. 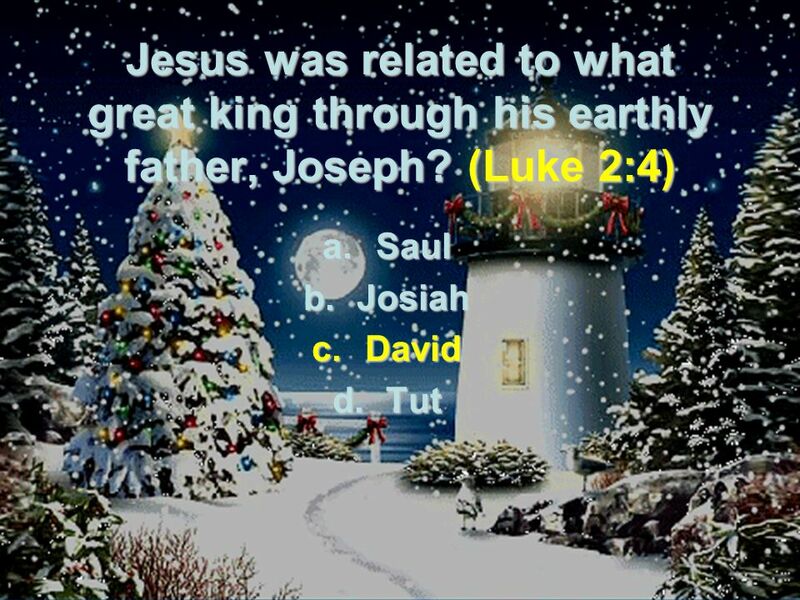 Download ppt "The Christmas Quiz. 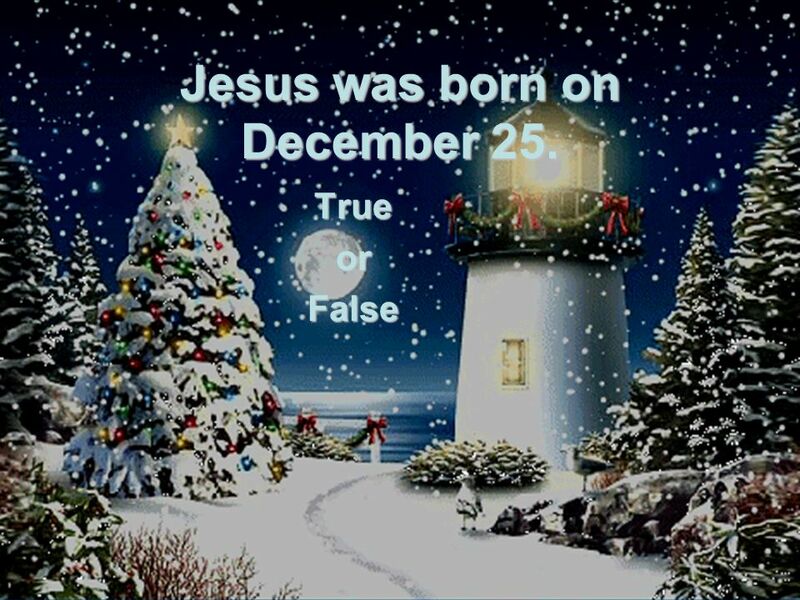 Jesus was born on December 25. TrueorFalse." The Birth of Jesus The Nativity Story. The Story of the Nativity Click to continue. Around two thousand years ago in a town called Nazareth, there was a young woman called Mary. She was engaged. Space Invaders By Joe Hart Click to Begin Click here to enter your name. 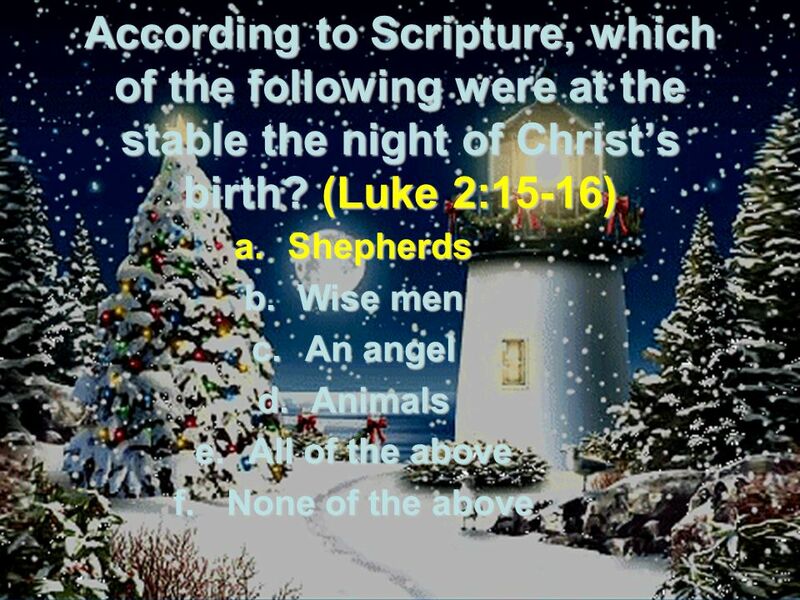 The Birth of Jesus The Nativity Story Appendix 5. Over 2,000 years ago a very special woman called Mary was engaged to a carpenter called Joseph. One fine day Joseph found out that Mary was pregnant. Mary was engaged to Joseph. When Joseph found Mary she was pregnant with a little boy. Joseph thought about leaving Mary on her own. As he thought more. The BIG Christmas quiz. Where was Mary from? 1.New York 2.Jerusalem 3.Nazareth 4.Bethlehem. When Jesus Comes 1.Some SCARED people - Luke 2:8-11. The Nativity By JOSEPH Long ago in Nazareth the angel Gabriel appeared and told Mary and Joseph they were going to have a baby. They had to call him. Chocolate ^ The Christmas Story. D C B A Submarine By Joe Hart Click here to begin. Click here to enter your. Jesus’ Birth. There once was a woman name Mary. Mary was going to be getting married to a man name Joseph. But before they got marred an angel came to.